Hi everyone and welcome to my third blog. This week I will be introducing you to four of my little friends, Jimmy, Jack, Jess and Jade. 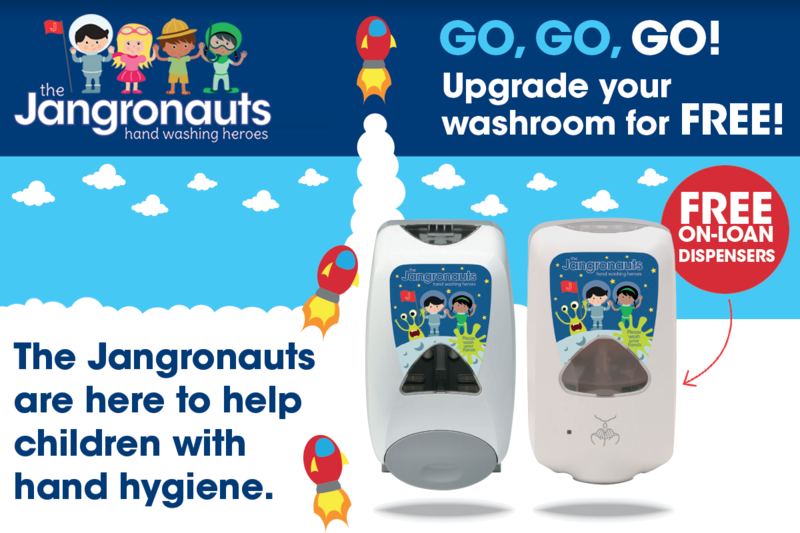 The loveable hand-washing heroes are ready to teach children the vital importance of hygiene in a fun, interactive and educational way and they feature on a range of hand washing dispensers, toilet tissue dispensers and hand drying units for washrooms. Giving teachers a helping hand! Lively educational resources have been put together to help teachers and parents engage with children and deliver the hand washing messages in a fun and interactive way. The activity sheets, story book, certificates and posters can all be utilised in the classroom to help reinforce the important message the Jangronauts bring to the children. We have worked with teaching experts to create a pack of curriculum ideas suitable for Foundation Stage and Key Stage 1. As hygiene is part of children’s Foundation stage assessment criteria (an early learning goal) there is a whole host of ideas including interactive circle time discussions, numeracy tasks and outdoor activities included in the pack. They also have their very own website, www.jangronauts.co.uk which has an interactive animated feature telling the story of the Jangronauts as you scroll down the page. All the Jangronauts have unique personalities and go on lots of exciting adventures. The one thing they have in common is their passion for hand washing. Here is a little bit more information about each of them…. Jangronaut Jimmy crosses space and time and he loves high-fiving aliens covered in slime! Jimmy must make sure that, when he gets home, he washes his hands with plenty of foam. Jangronaut Jack gets a ride on an elephant’s back and races a leopard around a race track. As the sun sets on another really wild day, he scrubs his hands washing the germs away. Jangronaut Jess loves to picnic in the sky, in her pretty balloon, way up high. She finds a rain cloud when it is time to eat, and washes her hands before yummy treats. Jangronaut Jade swims around the ocean with ease, but all the cold water had made her sneeze. Not wanting to spread germs everywhere, she washes her hands with soap….bugs beware! I hope you have enjoyed reading about my little friends, visit my social media pages for more info, updates and a cool competition later this week.